Babymetal were first up on the main stage and had a large crowd. Some were clearly fans, but many were simply curious to see how they'd sound. After a rather OTT intro video, the band came on stage in white robes and kicked off with an instrumental which sounded very good - proper metal. Then the three young singers came out and the main part fo the set started. Their J-Pop vocals are definitely a sound that like Marmite, you either love or hate, and the choreographed dancing takes a bit of getting used to for metal fans, but as they went through the set it was noticeable that the crowd grew rather than shrinking, and they did get a lot of applause. I can certainly see them being massive in Japan for a good few years, and judging by this performance and the fact they sold out the Forum in London then it looks like they're going to be big here too. Alestorm were next up. It's a bit early in the day for Pirate metal, but Chris Bowes and the rest of the band don't let that stop them as they put in a thoroughly entertaining set. It's disappointingly short, but the new single (Drink) gets an airing along with a few fan favourites. They get quite a few crowd surfers during their set including a couple dressed as pirates. Downing a bottle of Pimms on stage, Chris describes it as completely unenjoyable, but it's a good intro for "DrinK". Chas and Dave were the next band I saw after a spot of food. Definitely not the typical band for a metal festival, but despite the pouring rain that started as they took to the stage, they still had a decent size crowd, and went down surprisingly well. 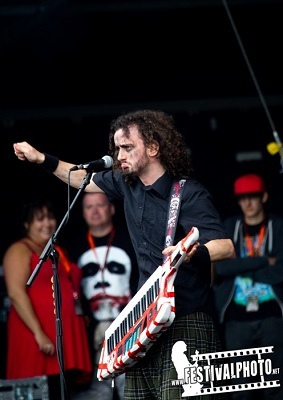 In fact Sonisphere has a history of including wild-card acts (Abba tribute band Bjorn Again being another band who have played), and they do tend to go down well, which shows lots of fans do listen to more music than just metal. Ghost were next up and although it seems slightly wrong seeing them in bright sunshine rather than in a dark venue, they do put in a great performance. The vocals aren't to everyones taste, but I really enjoy them as it helps them stand out from the crowd with their own sound. Anthrax came next with their second show of the weekend (having played in the tent the previous day), but the first time most people got to see them as the tent was unsurprisingly packed out. Anthrax, like the Defiled, have played every UK edition of Sonisphere (says a lot for the lack of imagination from the organisers), and always put in a great set. I would ahve loved to see them do "Among the living" the day before, but todays set is a pretty damn good one and they go down a storm. We then had the aerial dog fight with Druce Dickinson flying one of the first world war fighters. It was quite interesting to watch but as they were at a nice safe height it had a lot less impact than the spitfire flypast at Download last year which was a lot lower and more impressive. Carcass were next up with a great set of thrash metal. They've been going almost 30 years but show no sign of slowing down. A really good heavy set to enjoy while basking in the sunshine. I was surprised that they didn't get a better response from the crowd, and there was only a small mosh pit - rather disappointing. Frank Turner. Oh dear. I really don't see the appeal of him, and am genuinely puzzled how he got so high on the bill - I could only cope witha few songs before I headed to the bar and to find some more food. Slayer were next, but I have to say that I really don't understand their success - I just find them really rather dull on album and live, by far the weakest of the "Big 4". I'm clearly in a minority though judging by the size of the crowd they get. Iron Maiden were tonight's headliner, with their Maiden England tour. It's the same show they headlined Download with last year, but for the fanboys who had spent the entire day at the barrier just to be at the front for Maiden, that didn't matter. The crowd was massive, so for many fans the slope in the arena they were relegated to watching it on the big screens. Unlike at Download last year, the sound was spot on here, which made it a lot more enjoyable to watch. What can I say - it's a setlist packed with fan favourites (i.e. none of the new stuff), and as always Iron Maiden put on a great show. A great performance from these legends, and a great end to the day.